News: Danish firm Henning Larsen Architects has designed a headquarters for software giant Microsoft as part of plans for a new university and business district north of Copenhagen, Denmark. Commissioned by the council of Lyngby-Taarbæk, the project will see Henning Larsen Architects develop a 40,000-square-metre cluster of buildings containing student residences and shops alongside the Microsoft offices. The software firm also plans to make its facilities available to the community. "The citizens can use our open cafe and technology area, students can use our allocated study area, and we will regularly host different events that will connect us even closer to the local area and Denmark," said Niels Soelberg, CEO for Microsoft Denmark. 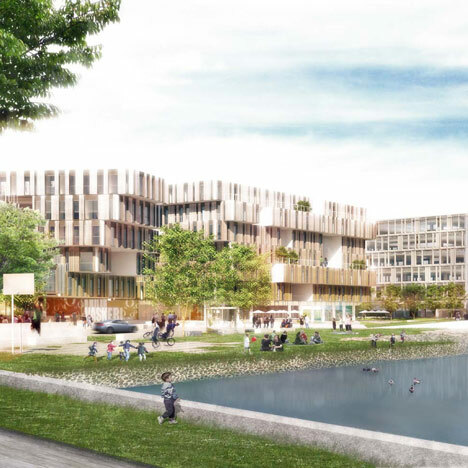 Located in the area of Kanalvejsgrunden in Lyngby, the buildings will form part of the council's vision for the Lyngby-Taarbæk City of Knowledge and Urban Development 2020, an initiative to promote the district as a leading university town and centre of creative business. "The project reflects an interesting urban development strategy. Knowledge-intensive businesses are connected to urban life and the local study community," said Lyngby-Tarbæk's mayor Søren P. Rasmussen. "The building will create a lot of new jobs and provide a welcoming, dynamic urban space where city centre and green areas meet." The architects will collaborate on the project with financial firm Danica Pension, engineering consultants COWI and project managers Alectia. Construction work is expected to begin later in 2013. Henning Larsen Architects' recent projects include proposals for a public square and offices in Trondheim, Norway and a concert hall and conference centre in Reykjavik, Iceland – see all architecture by Henning Larsen Architects. Last year Microsoft opened a Vienna office featuring themed meeting rooms, artificial grass and a huge slide – see all news about Microsoft. In the heart of Lyngby situated north of Copenhagen, Danica Pension in collaboration with Henning Larsen Architects, COWI and Alectia have developed the area of Kanalvejsgrunden with a new building that will comprise student residences, retail and Microsoft's new Danish headquarters. The project will create a new unique urban space accessible to everyone and will bring citizens, students and businesses closer together. The municipal council of Lyngby-Taarbæk looks forward to seeing an open, innovative building rising in the city centre. The project marks an important step in the realisation of the municipality’s visions for Lyngby-Taarbæk City of Knowledge and Urban Development 2020 – a locally developed initiative aiming at making Lyngby one of the leading university cities and centres of knowledge and creativity in Northern Europe. Mayor Søren P. Rasmussen says: "The project reflects an interesting urban development strategy. Knowledge-intensive businesses are connected to urban life and the local study community. In addition, the building will create a lot of new jobs and provide a welcoming, dynamic urban space where city centre and green areas meet." Microsoft's new headquarters forms part of the organisation's overall vision to create the workplace of the future – where employees are supported in their different ways of thinking, working and collaborating through a flexible interior layout, based on state-of-the-art technologies. Henning Larsen Architects has had a close dialogue with Microsoft in the space planning process. The municipality's ambition of positioning itself as a leading knowledge city has been a determining factor for Microsoft's decision to consolidate its activities and employees from their two companies in Denmark in Lyngby. "Microsoft is already well-established in Denmark with our 900 employees and more than 3,700 partner companies, and we also look forward to becoming an active part of the knowledge and university centre of Lyngby-Taarbæk. The citizens can use our open café and technology area, students can use our allocated study area, and we will regularly host different events that will connect us even closer to the local area and Denmark," says Niels Soelberg, CEO for Microsoft Denmark. The new building will be located on a 16,350 m2 plot in the centre of Lyngby, in the street of Kanalvej between Klampenborgvej and Toftebæksvej. The building will cover a total of 40,000 m2. The first sod is expected to be cut already later in 2013.